MANILA, Philippines - The country's longest-running drama anthology Maalaala Mo Kaya (MMK) has revealed its 'big announcement' on Saturday, May 14. MMK host and former ABS-CBN president Charo Santos-Concio announced the silver anniversary celebration of the classic program this May 2016. 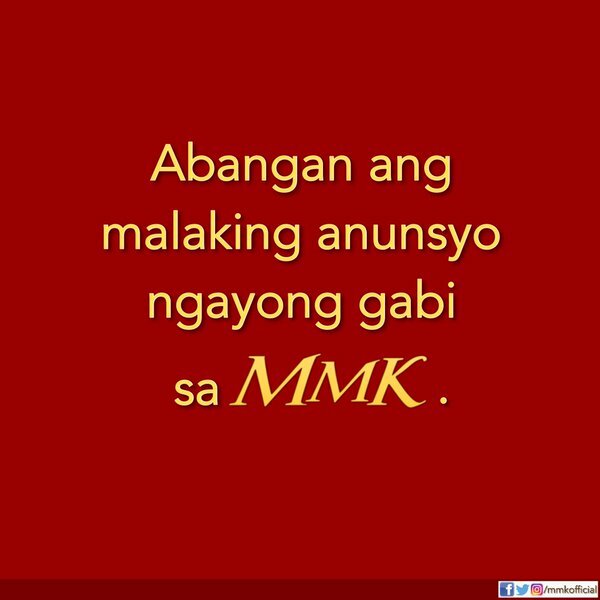 On Friday, social media accounts of MMK have hinted of a big announcement. "'Wag rin palagpasin ang aming malaking anunsyo mamayang gabi," MMK Official tweeted. The first episode of MMK titled "Rubber Shoes" was aired on May 13, 1991 starring Romnick Sarmenta and Vina Morales. Among the notable episodes then were "Regalo," topbilled by Vilma Santos, Ricky Davao and Maja Salvador; "Lobo," the highest-rating episode (47.9% in Metro Manila) that featured Regine Velasquez and Piolo Pascual; "Bintana," the first episode of MMK that was aired in high definition in ABS-CBN HD in October 2015. In 2011, the award-winning program of the Kapamilya network celebrated its 20th anniversary by doing a film version of the anthology starring Bea Alonzo, Zanjoe Marudo and Angel Locsin to be directed by Laurenti M. Dyogi under Star Cinema.